First I want to say thank you and let you know that I have not totally ignored the fact that I now have 100 followers! Thanks so much for following and I have to tell you I really did have intentions for an awesome giveaway. I wasn't quite close enough before Spring Break and for the past week I have been trying to book places for my wedding. Did you know people really plan weddings a year early? This is crazy to me. When people have to check to see if they already have a wedding for JUNE 2014 it makes me feel seriously anxious. Anyways I also had the pleasure of being observed this week! My first two years we had unannounced observations. I thought I hated those but I have now decided the knowing is worse! 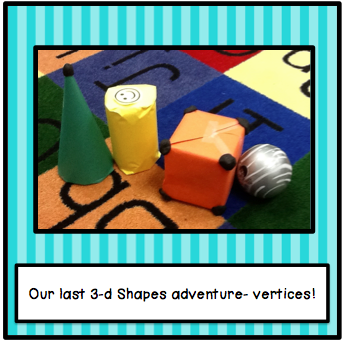 I taught by K babies the names of 3-d shapes before the lesson so I focused on the faces of the 3-d shapes during my lesson and did a few follow up lessons to reinforce the concepts. 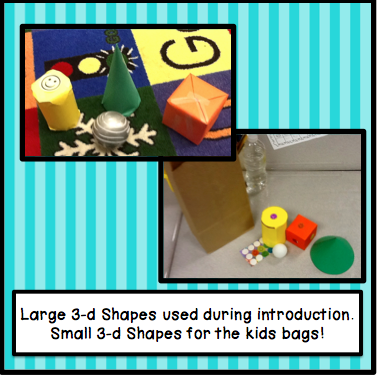 After the introduction and modeling with the large shapes the students used the shapes in their bags to place a smiley face on each of the flat surfaces. 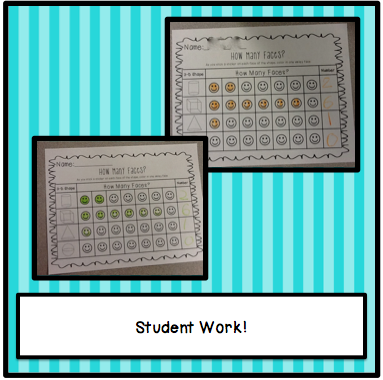 As students placed the smiley face down I stressed the importance of coloring the activity sheet right after so they could keep count. I knew teaching vertices would be quite an adventure so I took small balls of play dough and had the kids stick it on the points on each of the 3-d shapes. 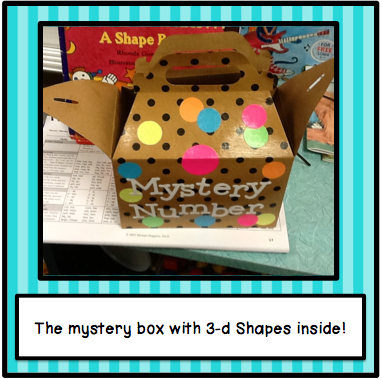 Tomorrow they will use the play dough on their shapes from the bags! Can I just tell you how excited they are to take these bags of shapes home-- seriously I should give these out for Christmas! If you made it to the end of this long post you deserve a prize and I promise I work on putting together an awesome giveaway with a TPT gift card as one of the prizes!! 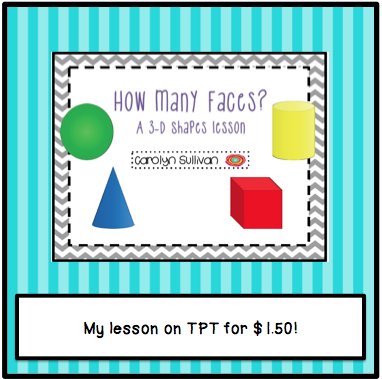 Snag the lesson plans for my How Many Faces? 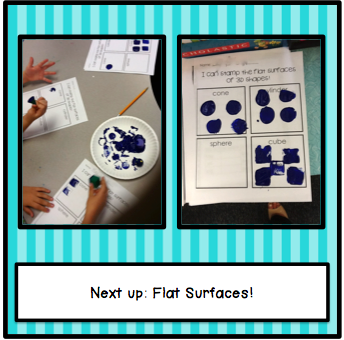 lesson plan which also includes the "I can stamp flat surfaces sheet!" for only $1.50! Yes! We found them at target around valentines day! You can find them at HobbyLobby sometimes too! 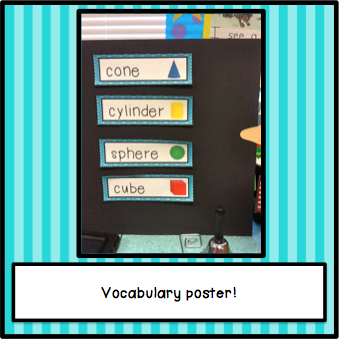 Sounds like your lesson and observation went well! :) I know about the wedding thing! LOL! To book our wedding venue we had to call on the EXACT date one year in advance and leave a message. Then they would call you back IF you were the first to call to book the venue! CRAZY! LOL! I am so excited for you! Congrats again! Oh my! We are going outs in June of NEXT year and people are like hmmm let me check to see if we have that date available. Like whattt? A Saint Patrick's Day Sale!